I’m definitely a minimalist in the kitchen and detest having to many kitchen gadgets. I’m pretty darn happy with a good chefs knife, powerful blender, large cutting board and my beloved bottle opener. With that being said (against my initial skepticism) I absolutely adore my spiralizer. If you aren’t familiar let me quickly catch you up. A spiralizer makes noodles out of fruits and veggies. If you regularly shop at the farmers market or participate in a CSA program I highly recommend this kitchen tool. In the heart of the summer we get to make noodles out of everything from zucchini to eggplants and even cantaloupes. Sweet cantaloupe noodles with a lime cilantro dressing is next level! I hesitated to post to many of those recipes last summer because I didn’t want to suggest folks go out and buy another kitchen gadget. But here I am easing into another busy farm season and I honestly cannot imagine my kitchen without this trusty little tool. This post is NOT a sponsored post. I just really love my spiralizer (I use this brand) and think it’s totally worth the $30 investment. You’ll find yourself whipping up sweet potato noodles in the fall and winter and zucchini noodles all summer long. I’m really thankful we had our spiralizer this winter because we were able to turn a lot of our root veggies into noodles. My favorite is turnip noodles and this recipe is top notch! 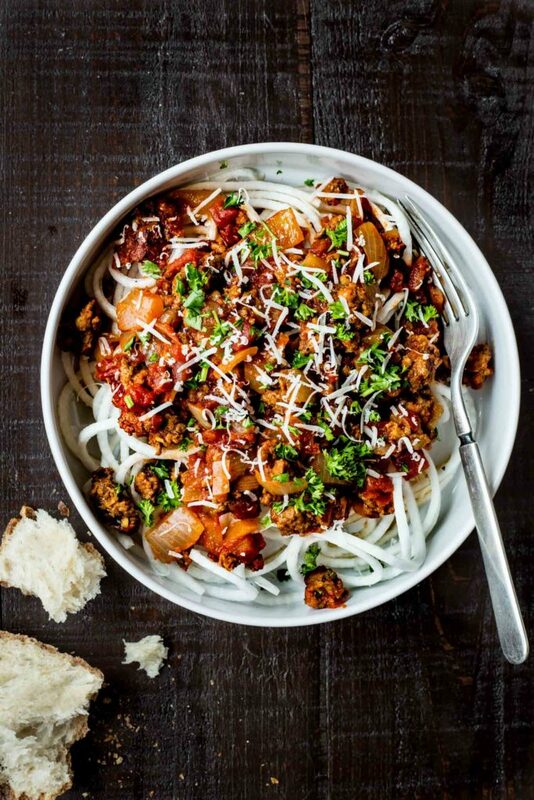 Turnip noodles slathered in a rich beef ragù is my kind of meal. The beef we used is from our favorite local rancher and the tomatoes were canned from last fall. This whole meal celebrates the flavors of Tumbleweed Farm and our local community and I hope you all enjoy this as much as we do. Heat the oil in a large deep skillet over medium high heat. Add the onion and cook, stirring occasionally for about 5 minutes. Add the garlic, carrot, celery and thyme. Continue to cook, stirring occasionally for about 1 minute longer. Add the ground beef and cook until the beef browns up a bit, about 3 minutes. Add the wine and tomato paste and cook until most of the liquid evaporates, about 4 minutes. Reduce the heat to low and add the tomatoes. Season with a hefty pinch of salt and pepper. Cover partially and cook, stirring occasionally, until the sauce is thick and fragrant. about 45 minutes. While the sauce cooks heat a little oil in a skillet over medium heat. Add the turnip noodles and cook, tossing the noodles often, until tender. About 3-5 minutes. Remove from heat and set aside. Divide the turnips noodles (or noodles of choice) between bowls. Top with the sauce and garnish with plenty of parmesan cheese and minced parsley. Can’t wait to make this!!!! There are so many spializers on the market: could you show a photo of the one you have. Thank you. The one that I link to in the post! What brand spiralizer do you recommend? I, too, hate having too many gadgets. For my wedding someone gave us a bread maker and I wanted to return it but never got around to it. So one day I just pulled it out of the box and quickly realized that I was never going to get rid of this even though it is huge and hulkey. It’s my one luxury gadget. But you’ve convinced me to finally try a spirilizer. I’m in! I love my spiralizer too. Have become obsessed with golden beet noodles. What do you think? Boodles or Beedles? Either way, they are delicious!